Hereford: Somehow in our society we’ve completely ruined the meaning of the word Interesting. We say it with a pause, and we follow it with a “but.” And the “but” is, seemingly, always a negative. If you asked a friend who went to a restaurant how it was and they replied with, “Well, it was interesting,” you probably wouldn’t want to go there. Angus: It’s like when you ask a friend if the blind date that they have lined up for you is attractive, and they reply with a, “well she’s interesting”. Hereford: But, to us, that doesn’t seem right. It’s a connotation based on an assumption that is isn’t fair. If you call a place interesting it should usually mean that it made you think, that it challenged assumptions, and that, ultimately, you liked the place. I say all that as a preface to this: Nom Nom Burger is an extremely interesting burger joint. Angus: Nom Nom Burger is a new restaurant that has opened on Park Road and is erasing the boundaries between American and Asian cuisine. 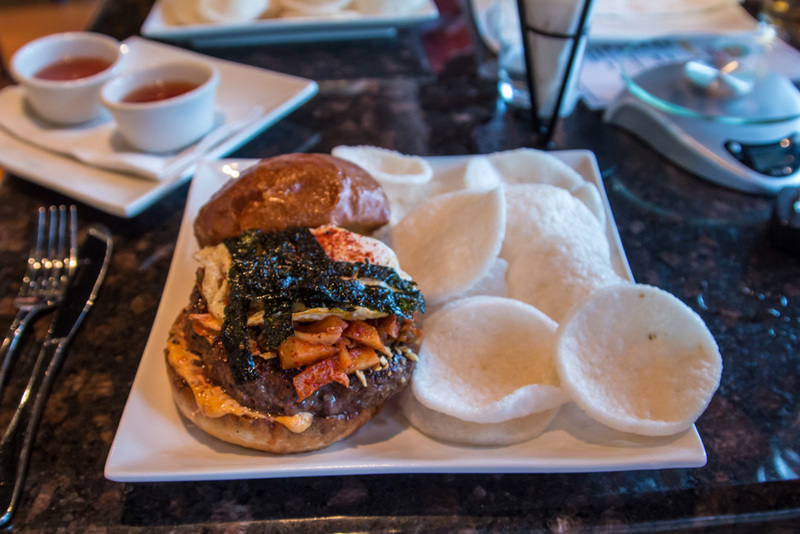 Each burger is inspired by a different Asian cuisine (Japanese, Chinese, Vietnamese, etc.) and they use all fresh ingredients. 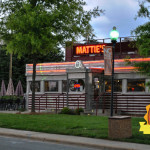 Each of the burgers and other sandwiches are designed by Tung Ngo, the owner and a restaurant designer who has developed many Asian restaurant concepts around Charlotte. We came by to interview Tung (which you can view here) and we stayed to try out his Asianized version of the American hamburger. Angus: Nom Nom Burger uses fresh premium meat from Sterling Silver and when you first bit into the burger you can automatically tell the difference in taste. The bun held up to the drippy juices of the rare burger and the over easy egg. The Spicy aioli, kalbi marinade, and roasted garlic all worked wonderfully well to bring in the taste of the meat itself. The thing that kind of threw me off at first was the Kimchi. Kimchi is a vegetable that is a traditional fermented Korean side dish. It had the consistency of cooked bamboo and was used in place of leaf lettuce. But after that initial bite, it brought a welcome crunch to the whole burger. I was really impressed with amount of “Asianizing” that Nom Nom did with the burger. You almost forgot that you were eating an American classic. Hereford: As Angus said, Nom Nom uses fresh, quality beef that is expertly seasoned and cooked. 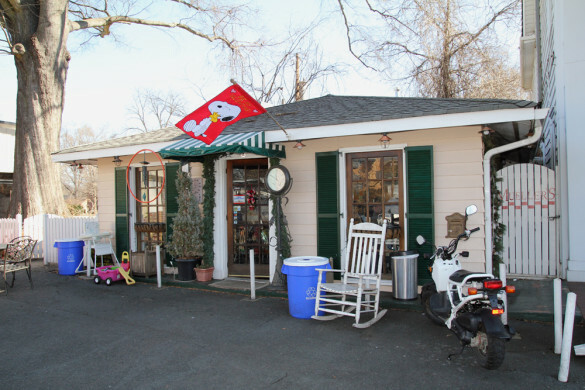 Even if you came here and got a plain burger, you would be satisfied. But what sets Nom Nom Burger apart are their toppings. 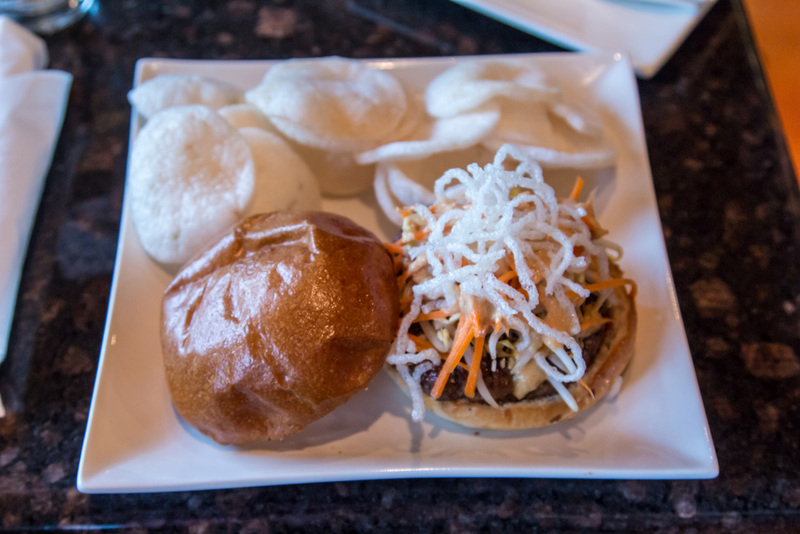 The Pad Thai Burger has a fascinating texture due to a couple of crunchy vegetables: bean sprouts and carrots. Carrots and sprouts aren’t the first thing that comes to mind when I think of burger toppings, but it works because they accent the flavor of the Pad Thai marinade and the peanut aioli. Speaking of the peanut aioli, it was an amazing way to highlight the Thai inspiration for this burger. It gave the burger an extra, full flavor. 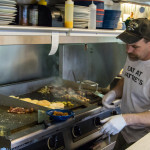 Angus: Of their burgers which are actually made from beef (many of the burgers are vegetarian, chicken, or fish), most are based on the “Asianized” concept. 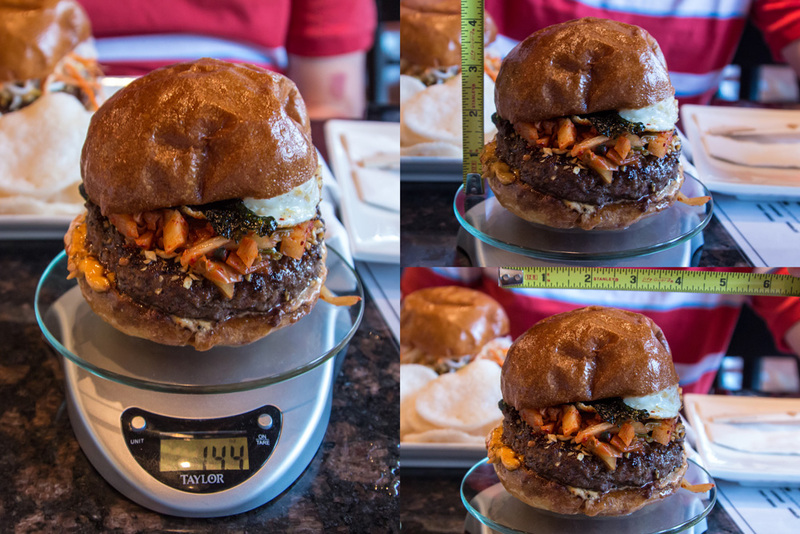 Besides what we ordered, there is also a Nom Nom Burger, their signature burger which is ground beef glazed with house special teriyaki sauce, provolone cheese, fresh sauteed Shiitake mushrooms with mirin, caramelized onions with ginger orange marmalade, and mayo. If those sound too strange for you, and I know there are some people who would rather have “safer” options, there is a Nom Believe burger, which is a plain burger with cheese, bacon, lettuce and tomato. They also have a Black and Bleu with sliced bleu cheese, shiitake mushrooms, and bacon. Hereford: Nom Nom’s burgers are served with shrimp chips. Going by name alone, you might think these are potato with, like, Old Bay seasoning or something on them. That would be incorrect. They are, I think, puffed rice chips with a shrimp flavoring on them a dipping sauce. They’re not for everyone. Both of us enjoyed them. My girlfriend came with us, and she didn’t 1. My understanding is that, at first, Nom Nom didn’t offer fries and only served shrimp chips as their side. They changed that due to customer reaction. 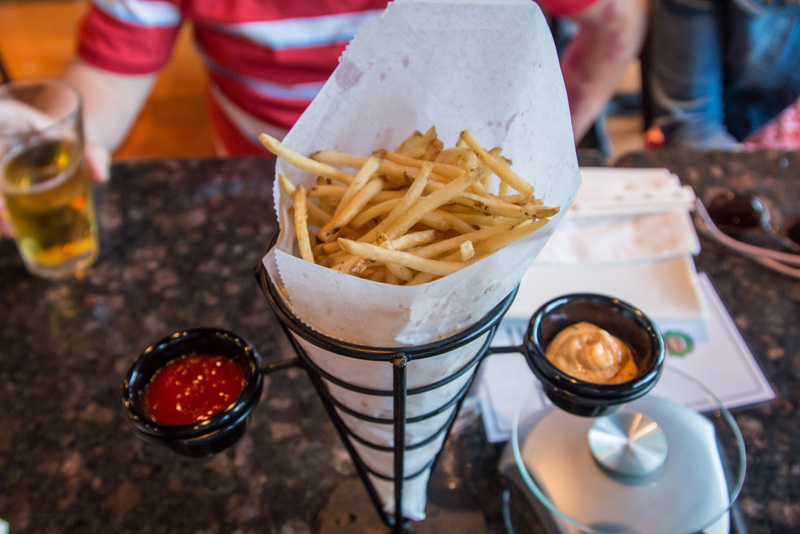 We ordered a side of fries as an appetizer, and they were quite good. If the shrimp chips sound too strange for you, the fries are a great, safe bet. Nom Nom has bottled beer that is meant to be paired with their burgers. Each burger is inspired by a particular cuisine, and they have a burger from that country to go with it. So, if you get the Nom Nom Burger, which is based on Japanese cuisine, you should go with the Ichiban (which is from Japan). Angus: The interior design of Nom Nom takes a simple approach with granite table tops, a long booth,and a large water feature. What we really liked about the inside was the fact that you can view the kitchen and inner workings of all the cooks creating these Asian burger masterpieces. 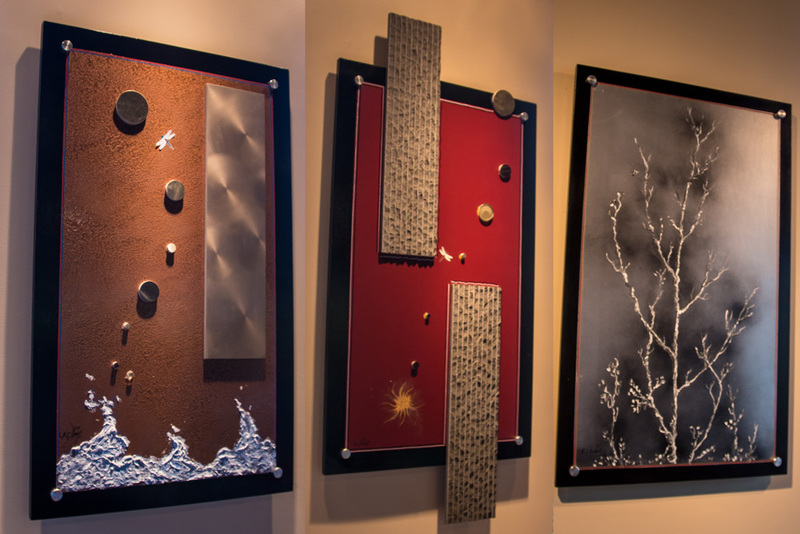 There were these three pieces of art that took center stage in the restaurant though. They had a contemporary minimalist vibe 2 created by using mixed media. They were 3D and they really were some amazing pieces of work. And I wouldn’t have noticed it if Tung hadn’t have pointed it out to us, but they, with the large water fountain, referred to the four elements in Asian culture: land, air, fire, and water. What was your favorite thing (non-food) about Nom Nom Burgers? 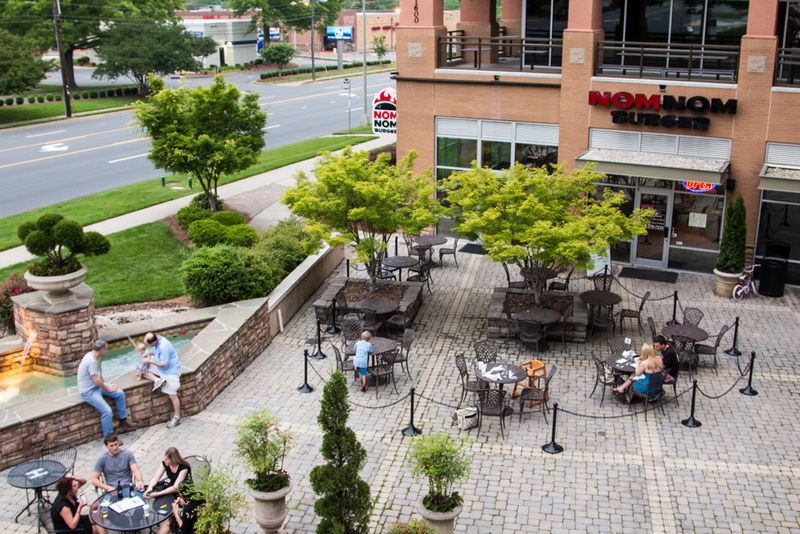 They also have a sweet outdoor sitting area that they share with the other restaurants in the area. It is plenty big so you won’t be fighting for a seat if you decide to sit outside. 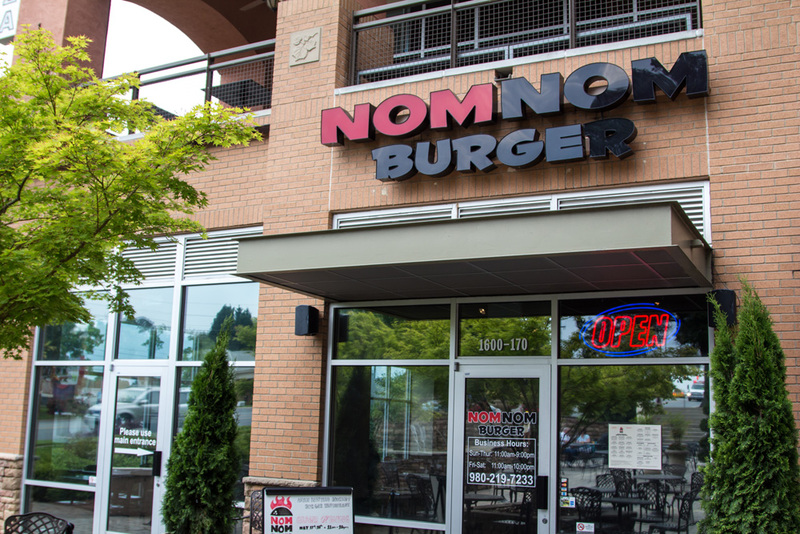 How is Nom Nom Burger different from Cowfish? Would you eat here again? 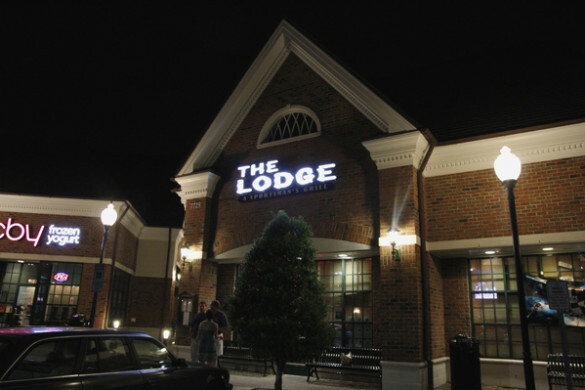 Next time you come by, what will you order? Angus: Most probably the Peking Duck burger. It has a seasoned duck breast, smoked pork belly, cilantro, scallions, cucumber, and hoisin barbecue sauce. There is something about duck that just screams fancy to me and I just have to try it. 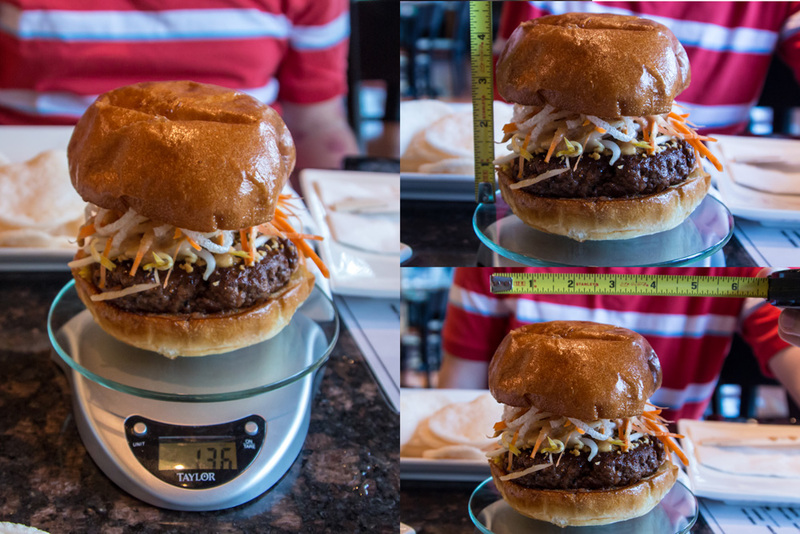 Does Nom Nom Burger earn the Charlotte Burger Blog Seal of Approval? We loved Nom Nom Burger. They have quality meat, cooked to perfection with a unique design. And their owner, Tung Ngo, is an extremely nice, impressive guy 4. Yes, they earn the Seal of Approval.